I have had a unique viewpoint in the homeschooling movement since 1978 when my mother started homeschooling my sister and me. The modern-day Christian homeschooling movement began in 1983, so I’ve literally seen just about everything that has ever happened in this sub-culture (for better or worse!). In 1988, my mother began publishing the national magazine, Home School Digest, which is the nation’s longest-running Christian home education magazine. I’ve personally worked full time in publishing, writing, and speaking in the homeschooling community since January 1993. I consistently speak to about 10,000-20,000 homeschoolers each year. My viewpoint is not omniscient, but I do think I have a unique perspective on where we have been and where we may be headed. My heart has been heavy for the future of this movement. In recent months, the homeschooling community has been rocked by a couple of national scandals involving some of the best-known speakers/advocates of homeschooling in America. As a result, many families are struggling to find their sense of “True North.” Many feel angry, some hurt, others betrayed, and more confused. I believe we are experiencing a shaking. That isn’t all bad. “And this word, Yet once more, signifieth the removing of those things that are shaken, as of things that are made, that those things which cannot be shaken may remain” (Hebrews 12:27). We’ve had some shifts before. In the early 1980’s and into the 1990’s, the homeschooling movement was largely controlled by those holding to a conservative, fundamentalist Baptist theology. The dominant curriculum publishers were A BEKA, Bob Jones University Press and ACE/School of Tomorrow. By the mid-1990’s, homeschooling leadership began to shift towards Reformed Theology. In many sectors of the homeschooling movement, the leaders were predominately adherents to some or all of the following: Christian Reconstruction, Dominion Theology, Postmillenialism, Calvinism, Covenant Theology, and Theonomy. Certain tenets of their theology influenced them to believe that they should have many children and systematically instruct them in the Christian faith. So homeschooling, for them, is a more logical outworking of their theology than it may be for Christians of other traditions. To many Christians (let alone non-Christians!) who are entering the homeschooling community, many of these ideas seem like they were deposited here by aliens from another planet! No one (or almost no one) in their churches adhere to these views, and yet, in some circles of homeschooling, these were strongly held convictions that dominated the cultural landscape. While many of these views (at least dogmatic adherence to them) have been questioned by many people for some time, the fact that a couple of their primary advocates have been caught in moral failure, has given many people a certainty that all (or most) of these views are wrong and must be avoided at any cost (even vilified and fought against). There is a belief among many homeschoolers that there must be something inherently wrong with the theology/ideology of these fallen leaders that has led to an inevitable outcome (sexual indiscretion and more). Of course, I don’t see people applying the same logic when a Charismatic or the recent Calvary Chapel leader commits sexual immorality. I don’t hear anyone saying that it is speaking in tongues or verse-by-verse exposition that is to blame (but I digress). 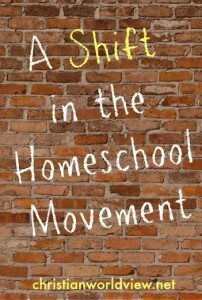 I believe that an irrevocable shift has taken place in the modern-day Christian homeschooling movement. I personally believe that some of the things that have driven this movement (including many of the viewpoints mentioned in the list above), will no longer have dominance. MY POINT HERE IS NOT TO DEBATE THE VALIDITY OR FALLACIES OF THOSE VIEWS. THAT IS COUNTERPRODUCTIVE TO MY GOAL. What I mean to suggest is that, regardless of how you may feel about it (elated or dejected), the day of the denim jumper in homeschooling is substantively over (in the early 1990′s, the denim jumper was jokingly referred to as the homeschooling mother’s uniform). Homeschooling continues to grow at an amazing rate every year. More and more families are concerned about the well-being, safety and educational success of their children. 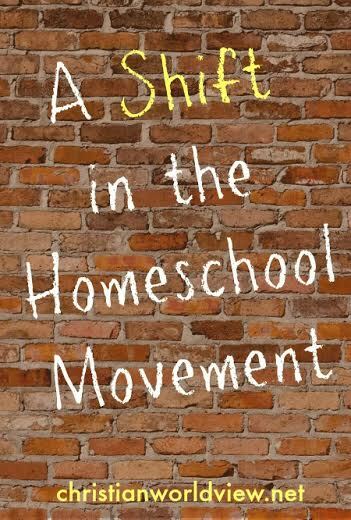 Homeshooling will grow, but the face of homeschooling has shifted. As the Millenials join the ranks of the exiting Baby Boomers and the dominant Gen X’ers in homeschooling, it will change. Online education is going to take more of a front stage. Even the academics won’t be done in traditional ways. In many cases, you won’t even find a textbook in the house (and it won’t be because they are “Unschoolers“!). This will also change the marketplace and inevitably impact conventions that sell physical books. The national “leadership” is also changing. In one sense, it is disingenuous to speak of homeschooling “leaders.” Homeschooling, by design and intent, is decentralized. There has never been one organization, individual or consortium that has controlled the entire movement. That is as it should be. That is one of the major flaws of government education (centralization and all the bureaucracy that comes with that). However, there is a difference between leadership and control. We need good, Biblically-sound leadership, but we don’t need top-down control of our movement. With that in mind, there are two kinds of “leaders” that exist. Okay, maybe three. Since the 1980’s, there have been individuals who wrote about not only home education, but an entire lifestyle surrounding teaching your children at home. In the early days, most of the people writing books and hosting seminars had very young children. They began promoting a vision of where we needed to go, and what goals our families should be aiming for. Never mind the fact that the vast majority of them had never successfully raised a child, never had a child go through the courtship processes they were advocating, and were, for the most part, just kind of making things up as they went; nonetheless, they were our fearless leaders! Fast-forward thirty years and many of these self-proclaimed experts ended up recanting much of their message as being misguided and off-base. They not only led their families into a ditch, they informed us, they also inadvertently led those following them into a ditch as well. How could this happen? I think there are a couple of reasons. First, there are leaders and then there are followers. Some people tend to want to ride on the coat tails of the success of others. 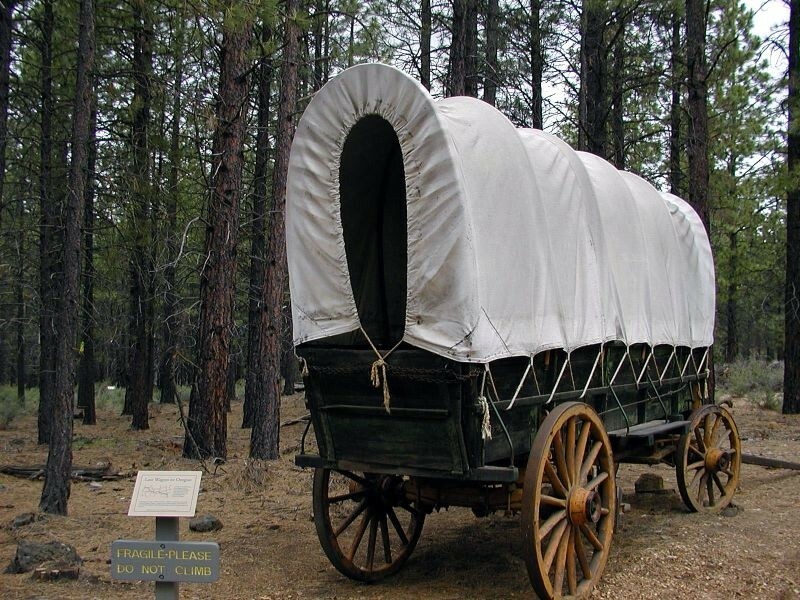 If they see a family who appears to be successful, seems to have a game plan, and knows where they are going, they’ll hitch their wagon to that horse and follow along, regardless of what trail they may actually be taking. Secondly, it seems to me that some people lack the ability to filter teaching. What I mean is that, when I listen to a speaker, or read a book, I tend to spit out a lot of seeds, while still enjoying the fruit. I think, “This is a great point, but THAT is a really dumb idea! I don’t know what I think about that concept … I’ll have to chew on that for a while.” Apparently, some people must lack the ability to do that. If speaker/author “X” tells them to jump off a bridge, by gracious, they’re gonna jump! Some people have taken teaching far beyond anything the original authors ever intended, and have, in a couple of rare occurrences, committed egregious (and even fatal) crimes against their children! It seems to me that the speakers who have presented cookie-cutter formulas for success, and long lists of rules and methods, are being shown the door. The current trends of speakers tend to be more cheer leaders who come alongside weary families and tell them they are doing great and they just need to hang in there and don’t give up. People want to hear that message. Whether the listeners are actually doing great or not is another subject that we won’t explore here. 2. The Homeschool Convention Coordinators. How do homeschooling speakers get to have a voice on the national stage? It used to be that most states had one state organization that networked state-wide support groups, lobbied for pro-homeschooling legislation, and put on an annual convention every year. The proceeds from these events funded the work of these state organizations (most of which were non-profits with volunteer staff). Most of these states were/are part of a national alliance of similar state-run homeschooling organizations. They were/are Christian in focus and had a shared/common statement of faith. There have always been rival groups in certain states who were not a part of this network of state organizations because of ideological differences with the statement of faith (some wanted to be more inclusive to people of other religions–or no religion), approaches to legislative matters, or just for-profit individuals or organizations that believe the free-market and competition are good ideas in themselves. There have always been for-profit conferences that weren’t connected to any larger state homeschooling organization, but simply hosted an annual event. However, since about 2008 or so, these regional for-profit mega-conferences have exploded across America. Some of them are boasting attendances of well over 10,000 individuals per event, and homeschooling has gotten a face-lift. A large percentage of the attendees at these events are first-time families, many of whom are simply looking into the home-education option. As more families abandon the traditional Christian state organization conventions, their revenues have dwindled, and in several states, they can no longer continue to host a convention. This means that the future of these groups (and the year-round services they provide for families) is in jeopardy. People often ask me, “Do you believe that these mega-conferences are good for homeschooling?” My answer is, as they say on Facebook, “It’s complicated.” At some of these regional mega-conventions, as many as 50% of the attendees are brand new to the concept of homeschooling. Thousands of new families begin home educating their children because of the messages and materials they find at these events. These mega-events are the most significant growth movement for homeschooling in operation today. They also have provided large revenues for the curriculum publishers, who then, in turn, can create even more materials for homeschoolers (which is good). a. Compete and outperform their new competition (which some have done in various states). b. Seek revenue from memberships, private or corporate donations, or other fund-raising methods yet to be discovered. The fact is, the mega-conferences, love them or hate them, are here. They will not go away in the near future. For better and worse, they are changing the face of the homeschooling movement. The reason I spent so much time here discussing the convention coordinators is because they are the gatekeepers that invite the speakers and give them a platform. I suppose it could be argued that those who produce and distribute the actual curriculum and supplementary materials utilized by homeschoolers are another layer of homeschooling “leadership,” although I personally think that is a bit of stretch. Back in the 1980’s and through about 2000 (before the internet went bonkers), there were a handful of homeschooling magazine publishers who were gatekeepers of a sort, selecting voices they felt had something to offer, and giving them a platform through the printed page. It was kind of like a homeschooling convention that met in your mailbox every month. Now, the independent media of the blogsphere has largely overshadowed these “gatekeepers” and they are less of a dominant influence in the movement today. Like it or not, homeschooling has a new face. It is no longer a hippie movement (as it was in the 1970’s). It is no longer a Fundamentalist movement. It is no longer a conservative Reformed movement. Today, it is a mosaic of younger, hipper and more diverse parents, who have no idea what you are talking about if you discuss people like Richard Fugate, Jonathan Lindvall, Chris Klicka, Dr. Raymond Moore, and Dr. Paul Lindstrom. They don’t have a clue. And couldn’t care less. Personally, I don’t think there is any value in the old-timers of this movement sitting around and cursing the changes. That will only be counter productive. If you want to do something to help grow home education, find out what the new, young families need, and provide it (or direct them to it). Learn to love them, not criticize them. There is a ditch on either side of the narrow road. People tend to pendulum swing from one extreme to another (and sometimes back again!). One example of that is a homeschooled graduate I know who decided that there was NO WAY he was going to impose on HIS CHILD the kind of “deprived” upbringing he experienced, so he promptly sent him to public school at age five. Within a couple of years, he had taken his child out and started homeschooling, fuming about, “I can’t believe they teach that stuff to such little children in school!” He was originally reacting against something he felt was oppressive, only to discover in the end, there was some rationale behind it, even if he didn’t get it at first. What I see looming ahead is a possible over-reaction in the wrong direction to very real errors and excesses in our movement. There have been definite imbalances in promoting a legalistic, formula-based approach to parenting and child-training. There have been very controlling parents who discipline their children in anger, out of a sense of personal indignation, rather than with any real love or redemptive consideration for their child. I must say, I think this is not typical of Christian homeschoolers, and I see it as being an anomaly of the movement, but it has happened (just as it happens in homes where parents send their children to traditional schools). There have been men who were absent, uninvolved and negligent. Some of them heard messages telling them that they needed to “be the leader in the home,” and they came home, like a bull in a china shop, and implemented their “patriarchal leadership” very badly. A lot of women have felt (or been) run over, and steam-rolled by these men who tried to impose their wishes without showing proper love and gentleness. In September of 2013, Michael Farris, founder of the Home School Legal Defense Association (HSLDA) spoke to state convention coordinators and other national homeschooling leaders, at the annual leadership conference they sponsor. He warned against the dangers of the excesses of extreme child discipline and a low view of women that has taken hold in some corners of the homeschooling community. He warned that unless homeschooling leaders actively speak against abusive and unGodly approaches to child discipline and unBiblical views of Patriarchal authority (that demean and devalue women), we risk losing our very legal freedom to homeschool. Mr. Farris has sounded a much-needed warning. My concern, however, is that when we over-react and swing to the other ditch, we end up teaching only love, grace and mercy (with no boundaries for children). By rejecting “Patriarchy” (abusive or domineering tendencies of men towards their wives and families), we may revert to the Feminism of the 1960’s, and all the problems that came with it, that led many women to react 180 degrees in the other direction by staying home and homeschooling their children. By rejecting rigid step-by-step rules about issues like strict clothing mandates and courtship procedures, we may revert back to the kind of sexual permissiveness that led to the legalism in the first place. Do we really want to go back to families where mom is trying to pull that whole family uphill all by herself, while dad is off playing golf, letting mom run the family all by herself? Do we want three-year-olds who rule the parents with an iron fist and parents who jump at their every demand? Do we really want teens who are groping their girlfriends in the back seat of a car because we don’t want to impose a legalistic standard on them? Do we really want to encourage the kind of American narcissism that says children are a nuisance and 0.8 children is the goal, because we want to avoid the imbalance of policing bedrooms and imposing doctrines not clearly spelled out in Scripture? We need the truth. We don’t need Pharisaism or Cheap-Grace “license to sin” theology. What we need is solid, balanced, truthful theology. We don’t need to pendulum swing back into the errors and excesses of worldliness that caused our movement’s initial pendulum swing into legalism. Neither ditch is helpful or beneficial. We need to stay on the narrow road and get out of ditches on either side. We need idols in the homeschooling movement like we need cancer. There is only one perfect role model for any of us to follow, and that is our Lord Jesus Christ. We can and should learn from other parents/teachers, but we should not assume that our families must look like theirs, or that what works for them will work for us. There is a need for vision and discussing better strategies to manage our money, budget our time, secure our marriage relationships, disciple our children, transmit a Biblical worldview, etc. However, especially for homeschooling leaders, I think we would all do better to spend more time making sure that our own families are in order and less on making sure everyone else is towing the line. If there is something that is working in your family, live it out and let others decide whether it is of value to them or not. I say this to myself as well. I believe God has given me a platform for a reason. I want to steward it well. I want to share what I have learned from the Scripture and the successes and failures of other families. However, I have a young family, and I dare not try to save the world at the expense of my own marriage and/or relationship with my own children. I dare say the vast majority of homeschooling speakers on the convention circuit struggle to maintain a proper balance with managing well their own families. It’s a dangerous treadmill. I believe God has called many of us to write and speak, so we shouldn’t abandon it altogether, but we need to be accountable, especially to our spouses, and be willing to come off the road when/if we need to and secure the home front (even if that means asking, “Would you like fries with that?”)! If we ever forget that the homeschooling movement is NOT about academics at the end of the day (they are a means, not an end), then Jesus will abandon us to our own devices. The homeschooling movement must NOT become ultimately about methods and tools (curriculum). It must be about Jesus, and His Lordship over our families. My concern is that the homeschooling movement may lose a passion for the pursuit of God and His truth. I think, to some extent, we already have. Legalism kills passion. But unGodly license promotes a passion for the wrong things. My hope is that we will remember that this call of fathers and mothers to turn their hearts back to their children did not originate in the will of man, but rather in the will of God. We need to pick a few hills that are worth dying on, and be willing to allow a few others to fall by the wayside. In my view, the authority of Scripture is a hill to die on. If we lose the Bible as the authoritative, inspired, infallible, inerrant Word of God, then we have nothing left on which to stand. The Lordship of Jesus Christ over every sphere of our existence is another. We cannot merely marginalize the Lord Jesus Christ as an optional plugin to our homeschooling endeavors. He demands supremacy over His people and demands to be recognized as our rightful head. With this said, how should we position ourselves towards those who deny the authority of Scripture and the Lordship of Jesus Christ? We should love them and reach out to them. We want to represent Christ well, not in a mean-spirited manner, but with humility and love. The leaders of this movement, however, must continue to hold up these banners as supreme, or else our Lord will leave us to our own devices, and the homeschooling movement will denigrate into another expression of humanism. On a practical level, we must also hold the line against any and all encroachment on our homeschooling liberties by the civil government. Private Christian home education must be the ultimate goal, as it allows parents to make the final educational decision for their children, rather than an over-reaching State. To the old guard, in the years to come, you are going to see a lot of changes in the homeschooling movement that you won’t like. These new homeschooling families do not resemble The Waltons (from 1970’s TV), and they may dress, act, and believe quite differently than you do. The fact is, they are going to be the new majority. Increasingly, you will find your lifestyle and values becoming more rare and less tolerated culturally. You are going to have to find a way to deal with that. My suggestion is to live well, proselytize less on lifestyle distinctives, and learn to love these new, younger families. On a personal level, the more that I hang out with these “Millennial Hipsters” (if I may be so bold as to affectionately label them that! ), I really like most of them. I think they are sincere, love their children, and want to follow God. They are just REALLY averse to following a list of rules that they don’t find outlined clearly in Scripture. And I don’t blame them for that. As a side note, please consider this article on some guidelines for navigating issues of Christian liberty and lifestyle preference with those who don’t share your values. To the Millennial Hipsters, welcome to homeschooling! I’d like to say that we want to hear from you and we welcome your input. You are making (in my personal opinion) the best possible choice for the future of your children. I would encourage you to be kind and gracious to these conservative families who may look more to you like something off Little House on the Prairie than a family living in the new Millennium. You may not get their decisions or motives, and that’s okay. Ask them to tell you about their journey. I think you’ll be blessed and will be given a lot to think about. You may find that you have a lot of commonality with their motives, if not their actual lifestyle preferences and decisions. I would also encourage you Hipsters to do yourself a favor and research the history of the homeschooling movement. Find out how we got here, and why. Learn about the hundreds of families who sacrificed and risked much to pave the way for you to legally home educate your children. Be willing to give the gray heads in this movement a listen. You may not end up agreeing with them, but I think you’ll be the wiser for having done so. For the foreseeable future, there is no place for homeschooling to go but straight up in terms of numeric growth. I hope that we can learn how to learn from the mistakes of our past, without running headlong into mistakes in the opposite direction. We HAVE made a lot of progress in this movement. It’s not all been bad. We have needed a correction, and we’ve gotten it. Now it’s time to walk humbly and mercifully into the future. Keep Christ the center. Love each other. That’s my plea. Israel Wayne is an Author and Conference Speaker. He is the Director of Family Renewal, LLC, and the Site Editor for www.ChristianWorldview.net.